Motorists awaiting the new Mercedes-Benz E-Class can set their clocks for mid-April as plans for its arrival take shape at Michael Moore’s of Athlone. Join the team at Michael Moore Mercedes Benz from April 14 to 16 for a chance to view and test drive the new E-Class. Fitted with an array of standard specifications and high-tech features that put it ahead of anything in the three-pointed-star stable and ahead of its rivals in the luxury segment, it boasts what Mercedes sales manager in Ireland, Ciaran Allen, says is “a combination of stylish design, competitive pricing, standard specifications, high-tech safety, and driving dynamics that redefine standards in the business-class segment”. 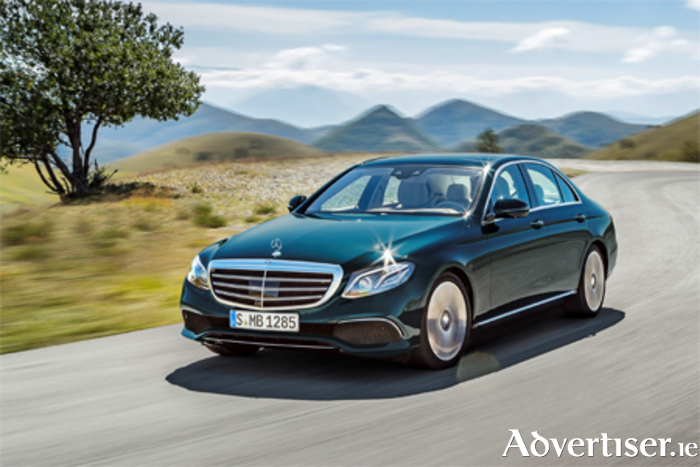 Available in three style and equipment lines, Avantgarde, Exclusive, and AMG, it maintains what is Mercedes-Benz’s established price-value offering whereby features that previously came only as options are now included as standard. Bringing this approach to what Ciaran Allen says is “a completely new level”, the entry level Avantgarde model will come decked with more than €7,000 worth of standard features compared to the outgoing version. Included in these will be Parktronic parking assist, heated front seats, full leather upholstery, reversing camera, LED static lights, satellite navigation, mirror pack, ambient lighting, storage pack, ‘through loading’ feature, seat comfort pack, alarm pack, and a ‘connect me’ function. Buyers can choose between models with a bonnet-mounted star and louvered grille preferred by traditional E-Class owners or one with the more youthful, sporty grille inset star. The first model to be marketed here will be a E220d Avantgarde Automatic version. The all-new E220d engine has lower CC (1,950 compared to 2,143 for the previous model ), lower C02 emissions (102g/km ), lower fuel consumption (4.3 litres/100Km combined ), lower road tax (€190 ), increased horsepower (194 HP ), and 400Nm of torque. All models available at market launch are equipped with the new 9G-Tronic nine-speed automatic transmission as standard. Despite its vastly increased level of standard specification, it will launch at €52,850 ex works, a price decrease of €850 compared to the model it replaces. Also available to order will be Exclusive (€55,210 ) and AMG versions (€57,650 ). With the E-Class, Mercedes-Benz has set out to give owners an insight into what motoring will be like for future generations. Showcasing a number of features that electronics and mobile technology make possible, features that may well become standard issue in the future, the new E-Class moves the era of ‘autonomous motoring’ even closer. One that every motorist will applaud is a feature that allows the car to be manoeuvred remotely via a mobile phone without the driver being inside. Call into Michael Moore Mercedes-Benz Athlone between April 14 and 16 to view and test drive the new E-Class. For more information call (090 ) 6403000.